From Michael Lewis, No.1 bestselling author of The Big Short and Flash Boys, this is the extraordinary story of the two men whose ideas changed the world. Daniel Kahneman and Amos Tversky met in war-torn 1960s Israel. Both were gifted young psychology professors: Kahneman a rootless son of holocaust survivors who saw the world as a problem to be solved; Tversky a voluble, instinctual blur of energy. In this breathtaking new book, Michael Lewis tells the extraordinary story of a relationship that became a shared mind: one which created the field of behavioural economics, revolutionising everything from Big Data to medicine, from how we are governed to how we spend, from high finance to football. 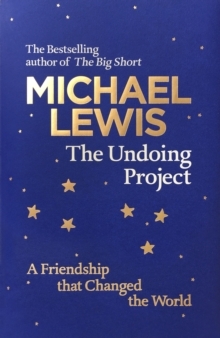 Kahneman and Tversky, shows Michael Lewis, helped shape the world in which we now live – and may well have changed, for good, humankind’s view of its own mind.